Clay began playing guitar at age nine after hearing Tony Rice’s landmark recording, “Manzanita.” From there, Clay’s life was changed because all he did was play his old cheap “guitar. Before too long, Clay got his first “real” guitar when his dad bought him a new Martin D18 for his birthday. 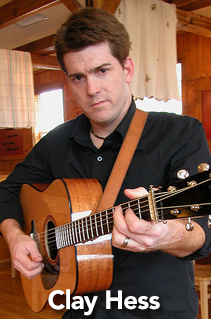 Clay continued to hone his skills and develop his own style, winning guitar contests along the way, including the Ohio State Guitar Championship in 1995. When he was 19, a friend told him about an open audition at Dollywood. Clay landed the gig, playing guitar with the band, True Blue. Fellow musicians were noticing Clay’s talents as a country and bluegrass guitarist. One of them was multi-Grammy Award winning country/bluegrass artist Ricky Skaggs. After leaving Skaggs’ band, Clay toured with The Mark Newton Band playing mandolin and then guitar before joining Mountain Heart. Shortly, he left to join one of the hottest young bands around, Sierra Hull and Highway 111, before starting The Clay Hess Band. Though Clay largely considers himself a bluegrass player, his influences range outside of bluegrass and include players such as Stevie Ray Vaughan, Charlie Parker and Leon Rhodes. My Favorite Guitars in conjunction with the custom shop at the CF Martin & Co. created two limited-run Clay Hess Signature models in 2005 and 2009.